Famara Beach is a majestic beach of four miles [6 km]. Sheltered by the mountain cliff which has the highest point on the island, Peñas del Chache (670 metres), Famara has some of the most striking scenery on the island. From the access road you can see the paradise you are about to enjoy. 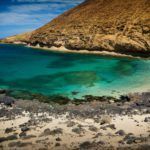 From the beach you can enjoy great views: looking back there is the Famara cliff and opposite, there are the islands of La Graciosa, Alegranza, Montaña Clara and Roque del Oeste (islets of the Chinijo Archipelago). 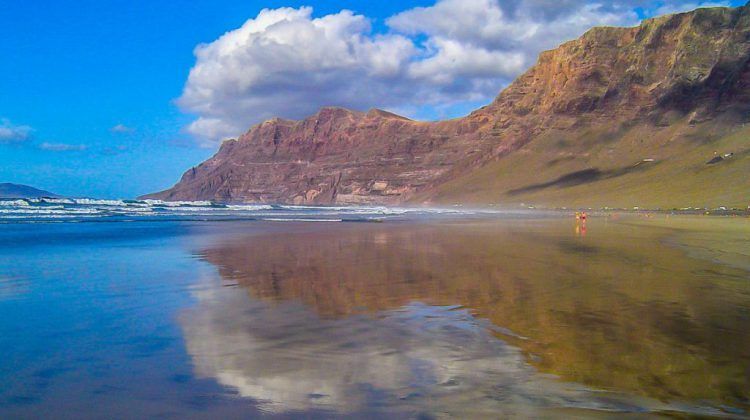 Although its waters look calm most of the time, the imposing “river” that separates Lanzarote from those islets hides extremely strong currents which you need to be careful of when swimming at Famara beach. 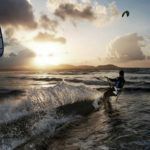 The predominant trade winds in the area make this beach an ideal scenario for adventure sports like surfing and kite surfing. 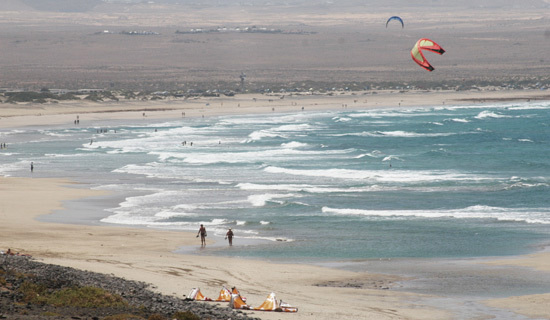 In the village of Caleta de Famara there is a wide offer for learning these sports. On this beach there is room for everybody: bathers, kids, and the not-so-kids, with their boogie boards and surfboards. The area is a multiple sports redoubt where walking, jogging, soccer matches, racquetball games are a popular sight. When the weather is pleasant the time of day we choose to enjoy Famara does not matter. 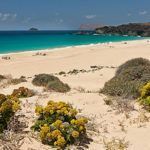 A walk early in the morning or at sunset is pleasant, and so is bathing at midday, or a barbecue in one of the multiple sheltered corners of natural stone scattered along the rustic stretch right before getting to the beach. 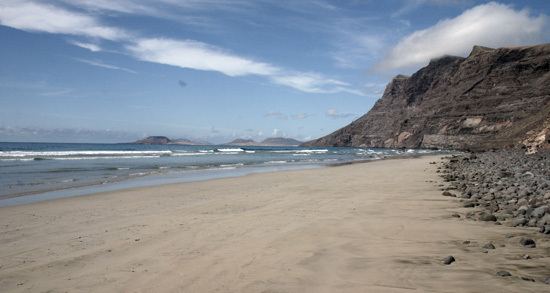 However, it’s true that at low tide Famara reaches its maximum splendour. And if to the low tide we add the fact that the calendar says it’s September or the first half of October… there are those who prefer Famara to Paris. The prevalence of the trade winds means a much more pleasant beach swim. 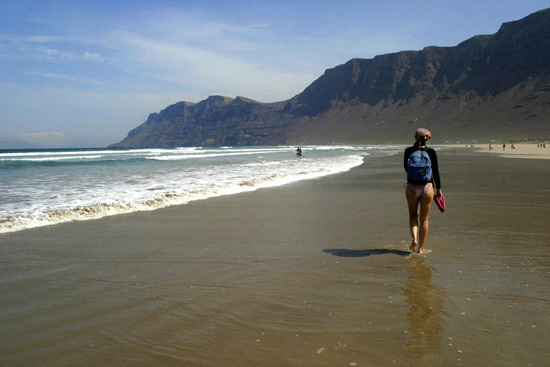 The breeze is nice and cool in Famara and therefore the heat is not so oppressing. 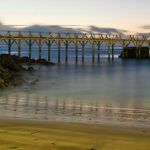 The closeness of Caleta Famara, with its gastronomic offer of fresh fish and its pleasant terraces right on the volcanic sand called jable, invite us to have some snack, recover strength and return to the beach. The atmosphere of the town blends perfectly with its majestic beach. 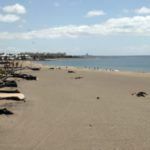 Relaxed, barefoot people walk out of their homes surrounded by jable volcanic sand, stroll to the beach, take a swim, and return home or stops at an outdoors terrace to drink a beer. Four miles [6 km] of spectacular beach in the northwest of Lanzarote. Arrival: By car. Parking along the beach. Important: Dangerous beach, beware of the ocean currents. Actual weather forecast: Just click here. 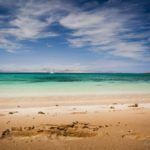 Lanzarote, a unique island to discover! Contact | Advertise with us!